West attended Garner Magnet High School in Garner, North Carolina and Hargrave Military Academy in Chatham, Virginia. As a senior in 1998–99, he earned first-team all-state honors playing for Hargrave. In his freshman season at Xavier, West was named to the Atlantic 10 All-Rookie Team after leading the A-10 in rebounding (9.1) and finishing fourth on the Musketeers in scoring (11.7). In his sophomore season, West led Xavier in scoring (17.8 ppg), rebounding (10.9 rpg, tops in A-10 and fourth nationally) and blocks (2.1 bpg). He recorded five 20-point, 20-rebound games throughout the 2000–01 season as he earned his first A-10 Player of the Year award. In his junior season, West was named the A-10 Player of the Year and the league's Defensive Player of the Year, while also winning A-10 Tournament MVP honors. He averaged 9.8 rebounds (26th in nation) and 2.5 blocks (22nd in nation) per game, and recorded the first triple-double in school history with 15 points, 10 rebounds and 10 assists against Long Island University. In his senior season, West garnered two of the five major college basketball Player of the Year honors, being named AP National Player of the Year and National Player of the Year by the United States Basketball Writers Association. He became the first three-time Atlantic 10 Player of the Year, and was named first-team All-America by the Associated Press in 2002–03. In addition, he became just the third player in Xavier history to surpass 2,000 points and only the second to eclipse 2,000 points and 1,000 rebounds, joining Tyrone Hill. In October 2007, Sports Illustrated released Sports Illustrated: The Basketball Book, which featured West on its NCAA All-Decade Team for the decade beginning in 2000. He was joined by Connecticut's Emeka Okafor and three Duke players, Jay Williams, J. J. Redick and Shane Battier. 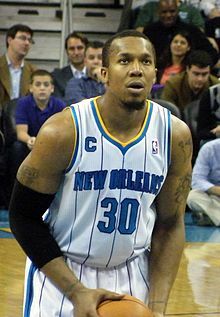 West was drafted by the New Orleans Hornets with the 18th overall pick in the 2003 NBA draft. After recording modest production in his first two seasons, in 2005–06, West enjoyed a breakthrough as he averaged 17.4 points and 7.4 rebounds with a .512 FG% in 74 games. That year, he finished second in the voting for the NBA Most Improved Player Award, behind Boris Diaw of the Phoenix Suns. He also saw some time at center, due to the team's lack of a true big man and demonstrated an ability to perform under pressure, as he converted three game-winning jump shots. In 2006–07, West ended the season averaging 18.3 points, 8.2 rebounds and 2.2 assists per game. Despite missing 30 games due to an elbow injury, West recorded five games of 30 or more points and 13 games of 20 or more points. West again increased his statistical production in 2007–08, and was selected to his first NBA All-Star Game as a reserve, along with teammate Chris Paul. Paul later stated that he would rather not play with a power forward in the league other than West, because "he's not in it for the spotlight, all he cares about is getting buckets [scoring]." West reinforced his desire to be a team player in a 2008 postseason interview, saying that he does not care about being overlooked but would rather "play and be as effective as possible" when he is out on the court. In 2008–09, West repeated as an all-star and posted a new career high by scoring 21.0 points per game. On March 25, 2011, during one of the Hornets' last games of the season against the Utah Jazz, West came down awkwardly after a dunk. The event occurred with 22.3 seconds left in the fourth quarter. West tore his anterior cruciate ligament in his left knee and was ruled out for the rest of the season. On June 27, 2011, West opted out of the final year of his contract to become a free agent. On December 13, 2011, West signed a two-year, $20 million contract with the Indiana Pacers. On January 12, 2013, West recorded his first career triple-double with 14 points, 12 rebounds and 10 assists in the 96-88 win over the Charlotte Bobcats. On July 10, 2013, West re-signed with the Pacers to a three-year, $36.6 million contract. In June 2015, he opted out of his contract with the Pacers to become a free agent. On July 17, 2015, West signed with the San Antonio Spurs. He made his debut for the Spurs in the team's season opener against the Oklahoma City Thunder on October 28, recording 8 points and 2 rebounds off the bench in a 112–106 loss. On January 6, 2016, West, starting in place of LaMarcus Aldridge, recorded season-highs of 18 points and 13 rebounds in a 123–98 win over the Utah Jazz, helping the Spurs extend its franchise-record home winning streak to 30 straight regular-season games dating to 2014–15. On July 9, 2016, West signed with the Golden State Warriors. West emerged as a key bench player for the Warriors, particularly for his skilled passing abilities. Throughout January and February 2017, West missed 14 games with a non-displaced fracture in his left thumb. On March 29, 2017, West recorded a season-high 15 points and a game-high plus-23 in a large comeback win against the San Antonio Spurs. The Warriors finished the season as the first seed in the West with a 67–15 record. Following a 129–115 victory in Game 4 of the Western Conference Finals over the Spurs, the Warriors were undefeated in the first three playoff series, reaching their third straight NBA Finals series. West played in every playoff game, as the Warriors defeated the Cleveland Cavaliers 4–1 in the 2017 NBA Finals. The Warriors' 16–1 playoff record was the best ever postseason winning percentage in NBA history. On July 25, 2017, after winning his first championship ring, West re-signed with the Warriors for one more year, with expectations to retire after the 2017–18 season. On January 8, 2018, in a 124–114 win over the Denver Nuggets, West became the 127th player in NBA history to play in 1,000 regular-season games. After reaching that milestone, he noted that he might consider signing again for the 2018–19 season, saying, "It all depends on how my body feels. Right now I feel good." After winning his second NBA Championship, West announced his retirement from the NBA after 15 seasons on August 30, 2018. West is the son of Amos and Harriet West. He and his wife Lesley have one daughter, Dasia, and one son, David Benjamin. In November 2018, West became the first Chief Operating Officer (COO) of the Historical Basketball League (HBL), a college basketball league set to be launched in 2020. West is extremely interested in education, "black history, philosophy and various societal issues". He also loves to make mixtapes for his teammates, saying that it is a healthy habit that keeps him "in the house and off [his] feet". West has a Xavier "X" tattooed on his arm which displays, on either side, "My life, my way". ^ a b c d "David West Stats, Video, Bio, Profile". NBA.com. Archived from the original on June 2, 2014. Retrieved November 30, 2014. ^ "Phoenix's Boris Diaw Wins the 2005-06 NBA Most Improved Player Award". NBA.com. May 1, 2006. Retrieved May 2, 2006. ^ "Hibbert Picks Up Option; West Declines". NBA.com. June 29, 2015. Retrieved June 30, 2015. ^ "Spurs Sign David West". NBA.com. July 17, 2015. Retrieved July 17, 2015. ^ "Donovan wins NBA coaching debut, Thunder beat Spurs 112-106". NBA.com. October 28, 2015. Retrieved October 28, 2015. ^ "Duncan scores 18, Spurs rout Jazz to move to 21-0 at home". NBA.com. January 6, 2016. Retrieved January 6, 2016. ^ "David West's reliable passing off the bench key for Warriors". USA TODAY. Retrieved May 23, 2017. ^ "Curry flurry: MVP's huge third quarter propels Warriors". ESPN.com. February 23, 2017. Retrieved February 24, 2017. ^ "Former Spur David West key to Warriors' win in San Antonio". Retrieved May 23, 2017. ^ "Warriors win NBA title, Kevin Durant claims Finals MVP". Retrieved June 13, 2017. ^ Maloney, Jack (July 1, 2017). "NBA Free Agency: Veteran David West, Warriors agree to one-year deal". cbssports.com. Retrieved January 7, 2018. ^ "Curry goes off again, Warriors top Nuggets for 5th straight". ESPN.com. January 8, 2018. Retrieved January 8, 2018. ^ Haynes, Chris (January 9, 2018). "David West still going strong after hitting 1,000-game milestone". ESPN.com. Retrieved January 16, 2018. Wikimedia Commons has media related to David West (basketball).